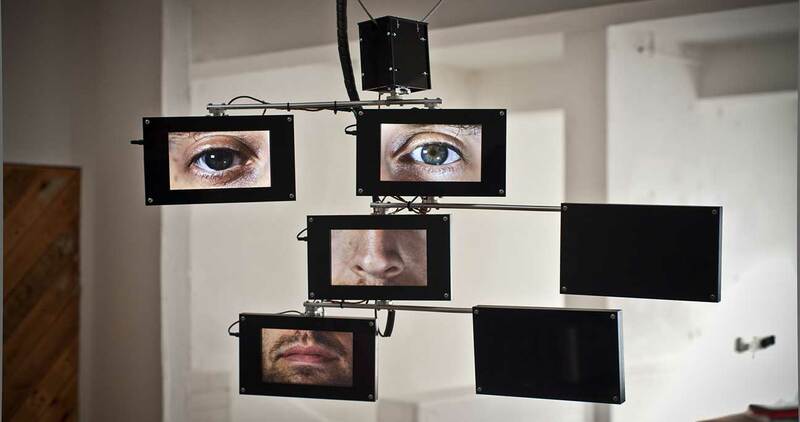 Neil Mendoza’s work combines sculpture, electronics and software to bring inanimate objects and spaces to life. By decontextualizing objects with technology and vice versa, the constituent parts of his work can be looked at in a new ways. Using this medium, he explores themes of the absurd, the humorous, the futile and the surreal. He has an MA in math and computer science from Oxford University and an MFA in design media art from UCLA and has taught classes on art and technology at Stanford and UCLA. His artwork has been exhibited by The Science Museum, The V&A, Watermans, Currents New Media Festival, The Children’s Museum of Pittsburgh, Minnesota Street Projects, PICNIC Festival, The AND Festival, ISEA, Kinetica, The Nottingham Playhouse, The Barbican, BBC Big Screens, The Museum of London, Young Projects Gallery, Arena 1 Gallery and Oi Futuro among others. He has created digital artworks and installations for a wide range of clients including Accenture, Adidas, AntiVJ, Arcade Studios, Audi, Bentley, Brother, Burton Snowboards, Doritos, Ford, Guild LA, HTC, Jason Bruges Studio, LCF, The Light Surgeons, Moving Brands, New Angle, Nokia, Nuit Sonores, O2, Orange, Poke, Swatch, Universal Everything, Wieden & Kennedy and Wired Magazine. He also co-founded the art collective is this good?.